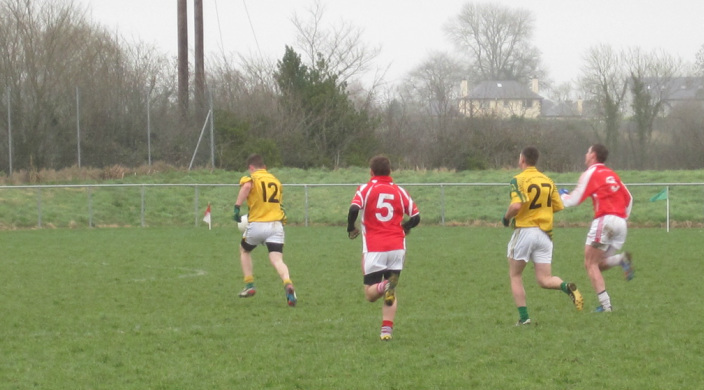 Two late goals from Castletown helped them earn a draw against Ballinlough in Grangodden on Sunday in the 1st round of the Divsion 2 A-league. Ballinlough defenders can't make it back as Castletown get in for a late goal. When Ballinlough substitute James O' Keeffe nestled the ball in the top corner of the net in the 54th minute it looked as if his team were home and dry as they led by six points but the concession of two late goals denied them of what would have been a fully merited victory. Scoring has been a problem for 'The Reds' in recent years, but to score you must first create and with Cian Mallen and Tommy Mc Cullen strong at midfield and Ronan Mc Guinness busy at centre half forward, they probably created enough chances to win two matches. However they lacked the guile up front to put their opponents to the sword and instead of running out comfortable winners they held a slender one goal lead in the dying seconds after Castletown scored their first goal, but then they had the chance to secure a four point win, but Colm Mallen's goal attempt was brilliantly saved which left the door open for Castletown to launch one last attack and Ballinlough paid a heavy price when the ball was finished to net to leave the scores level. The first half was slow to spark into life with defenders on top, with Padraig Muldoon and Michael Geraghty steady at the heart of their defence Ballinlough had the upperhand and points from Peadar Byrne (2f), Niall Farrelly and Ronan Mc Guinness gave them a 0-4 to 0-1 lead before Kevin Ross fired over a good score to leave just two points in it: 0-4 to 0-2 at the break. Castletown had the aid of the breeze in the second half but they struggled to make any inroads as Ballinlough continued to dominate and they took a commanding lead when substitute Kevin Devine bundled the ball to the net in the 35th minute after Peadar Byrnes '45 had come back off the cross bar, Kevin Ross replied with a point but they trailed by 1-4 to 0-3 with 40 minutes played. Kenny Smith reduced the margin to a goal with a good point in the 56th minute but when O' Keeffe netted Ballinlough looked to have the two points in the bag but crucially the last two scores of the game were goals for Castletown, who have to commended for the way they kept battling despite trailing by two goals in the dying minutes. Ballinlough: D. Muldoon, Colm Mallen, P. Muldoon, R. Farrell, B. Smith, M. Geraghty, L. Maguire, Cian Mallen, T. Mc Cullen, M. Mc Cullen, R. Mc Guinness, N. Farrelly, J. Tunney, P. Byrne, J. Reilly. Subs: K, Devine for Reilly, J. O' Keeffe for Farrelly, K. Mallen for Tunney and J. Baugh for Mc Guinness.